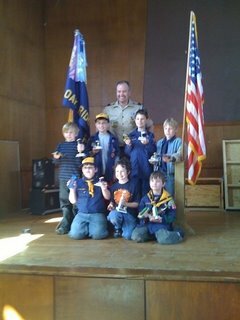 Cub Scout Pack 226 of Oak Ridge, Tennessee hosted its annual Pinewood Derby this morning -- with some of the fastest cars I've ever seen! Competition was tight, with nearly all races decided by less than a single 7" car length (and the championship round by less than 1/2 a car length between 1st and 6th place!). 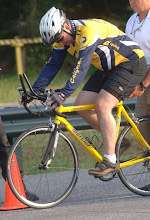 Thankfully Wolf Dad Jim Simmons had a slow-motion video camera for photo-finish reviews. A Bear Cub (Reid Dukes) won the overall championship, while our Wolf Den's Cameron Starr (who is fast at everything) took second place in the Pack. Both of these boys will get to compete in the Pellissippi District Pinewood Derby next month against Cub Scouts from the greater Knoxville area. Jarrett's design of choice this year was a Star Destroyer. 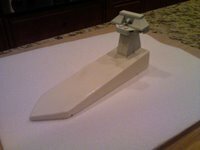 Given the narrow width of the Pinewood Derby blocks, our end result (shown at left before polishing and mounting the axles) turned out more like a Clone Wars-era starship. One design flaw, though, is the pointed bow: the starting pegs on our track are just that: narrow pegs. So we risked starting each race a little bit askew. 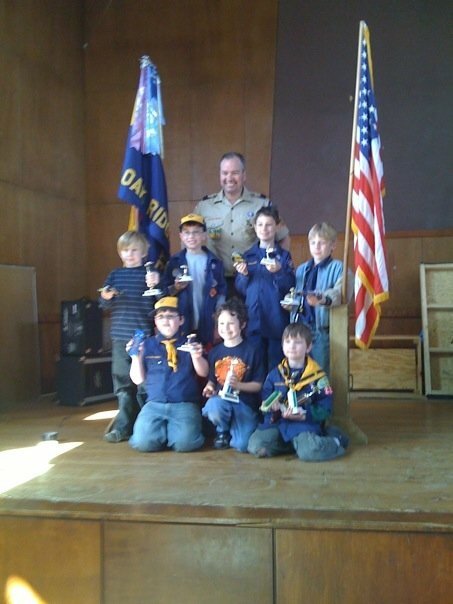 The good news is our Wolf Den had nearly full participation -- and if our newest Cub Scout hadn't succumbed to a stomach bug, we'd have had all nine participating! Way to go, Wolves! !